If you need a solid PayPal analytics software that shows meaningful analysis of your business then definitely you must look out for it. Nowadays, people have more chance of getting high revenue & success when they are using a payment analytics tool for all of their transactional work. Through them, you can track various matrices like MRR, ARR, churn, incoming payments & many more things. And all of these things are not easy to be tracked. One should have an analytics tool which can have more features than payment tracking that can actually help them in increasing revenue & minimizing the churn. 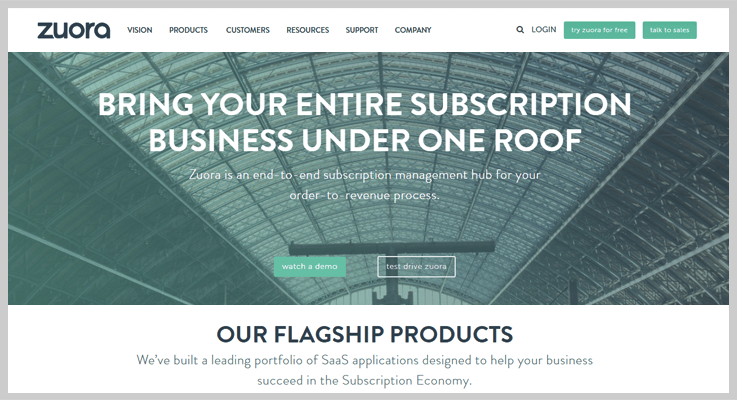 Track your sales, active subscriptions, new subscription. Get transactions details that are done via your payment gateways and a lot more. The software mentioned below supports different payment gateways like PayPal, Stripe, Authorize.net and a lot more. Here, you can quickly integrate your gateway with any of the tools and start analyzing all your payments at a single place. Given analytics software provides various functions such as a dunning feature which effectively handles all your failed payments and it will analyze the ARR metric with ease. Now, without wasting a single second let us just know about each PayPal analytics tools in a detailed manner. Read some more blogs too!! You can track the total number of sales, new subscriptions, active subscriptions, refunds, or canceled subscriptions, etc. in a few seconds with the help of this payment data analytics tool. Moreover, one can check the metric like customer lifetime value, MRR, current monthly revenue and more. Along with the analytics feature, it also gives you a subscription management functionality which provides a cloud-based recurring billing. This recurring billing API’s will help you to manage your billing needs in an organized manner. Using its data analytics feature, you can easily filter any of your customers on the dashboard so that it will be easy for you to recognize his payments and billings. Starter Plan: You can buy this plan at just $5/m where you can manage upto 50 customers along with various features like setup unlimited products, unlimited revenue, multiple payment gateways and more. Rookie Plan: This plan will costs you around $29 on monthly basis. You will be able to track PayPal, as well as Stripe payments of 1000 customers &, manage their subscriptions. Pro Plan: For unlimited customers & their subscriptions, you have to pay $59/m. Also, you will get the features like client portal (upcoming), custom checkout page & many more. Advance Plan: You have to pay $99 per month & you will get features like affiliate system, refund option, custom domain & so on. You are able to change the title and button text of your checkout page. Also, you can upload a logo of your organization using this software. The tool has provided you a report where you are able to manage or monitor the new subscription, recurring bills etc in a graphical format. It will allow you modifying the domain of the checkout/payment page. So, you can set it according to your business or profession. Pabbly Subscriptions tools also provide some other payment gateways such as Stripe, which will be equally beneficial as the PayPal gateway. Putler is the best solution for the people who wanted to track and grow their e-commerce business. This tool allows them to easily analyze net revenue, total sales, revenue by weekday and hour of day etc. This payment processing tool gives you an accurate analytics of your business insight. Further, gives you a comprehensive reporting on sales, products, subscriptions, customers, and visitors. Starter: This plan cost you $29/m where you will get 300 paid orders/ month, 2 integrations and 2 years historical data. Growth: Buy this plan at $79/m with 3,000 paid orders/month, 7 integrations and 5 years historical data. 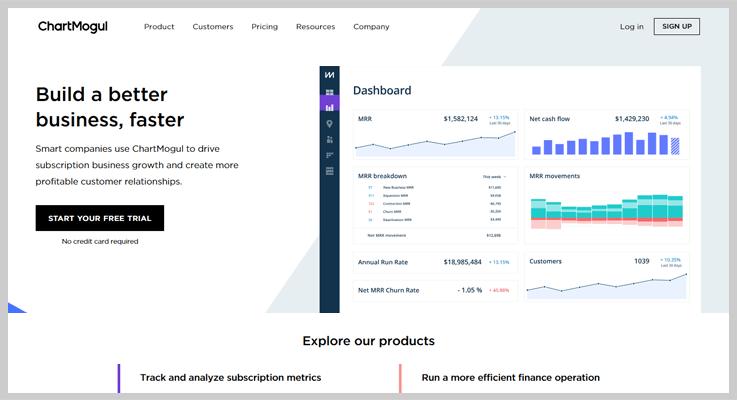 Scale: Grab this advance $249/m, in this plan Putler provides 10,000 paid orders/month, 20 integrations and 7 years historical data. Customer segmentation feature makes you able to differentiate between different sorts of customers. It allows you to share reports with your team, mailing list export. Also, it provides weekly email reports to you which saves your time and make your work easy. You can integrate multiple businesses, payment gateways in this tool. Moreover, it has four dashboard support these are main dashboard, sales, or customer and subscription dashboard. Putler is the fastest tool that why work of your search, and issue refunds will be done in 10 times faster than other PayPal analytics tools. This tool is helpful in analyzing all the payment and subscription metrics in the fraction of time. Also, Zuora supports PayPal payment gateway which is secure and easy to use. It helps in collections for a recurring revenue business. Zuora offers you a free trial, for the monthly and yearly paid plan you can contact their sales team. It has pre-built report library which consists of 40 best-practice subscription reports. This will help you to provide reports for your billings, bookings, cash, and revenue metrics. Consist of an intuitive report builder where with the help of easy drag and drop fields you can dynamically customize your reports. This software gives you a detailed analysis of your payment metrics like MRR which help you to increase the overall growth of your company. Zuora gives you a prediction of chances that a customer leaving your services or getting a subscription to renew. Moreover, the tool helps you to verify the pending refunds before processing to the next payment. 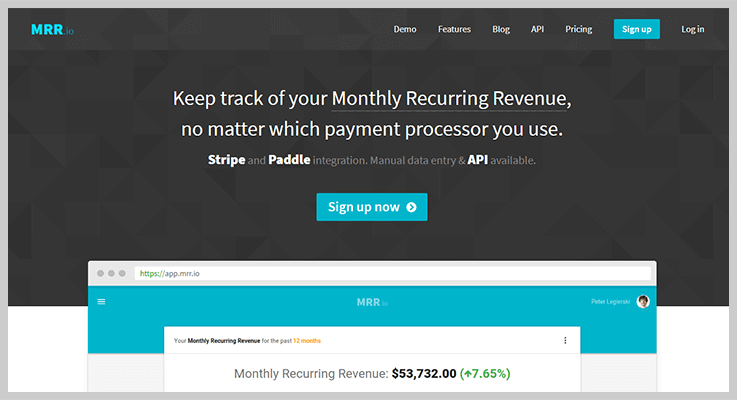 This one is a useful tool for payment analytics as it keeps track of your monthly recurring revenue, no matter which payment processor you use. Here this tool supports various payment gateways such as PayPal, Stripe, and Authorize.net etc. Basic Plan: This plan cost you $0. Yes, you read it right the basic plan of MRR.io payment analytics tool is FREE. It gives you 100 paying customers, basic email reports along with all the metrics. Pro Plan: Buy this plan at a reasonable price of $19/month where you will get 250 paying customers along with all metrics and email support. It has an advance email reports feature where you will be able to receive each and every alert of business metrics via emails. You can enter data manually within the app as well as through API. For this purpose, payment processors can be PayPal, Chargebee, Recurly, Salesforce, etc. This analytics tool allows you to analyze and monitor average revenue per customer, about paying customers to churn. Further, it helps in analyzing customers refunds, MRR expansion and more. 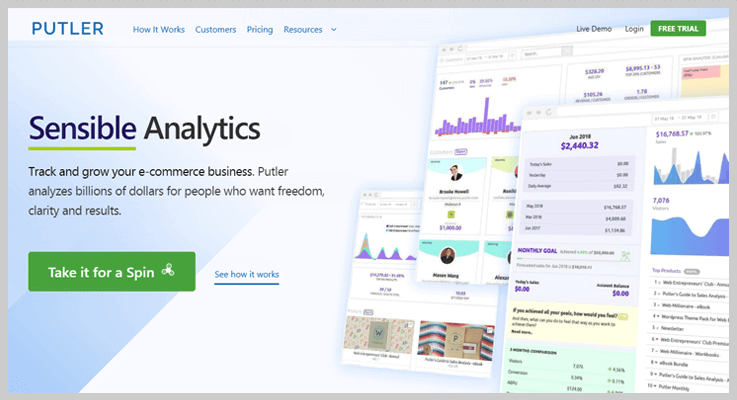 ChartMogul is an important tool in the PayPal analytics tools list. Here you just need to connect with major subscription billing providers, and you can track and analyze your data in one central location. This tool allows you to see your monthly recurring revenue, churn rate, customer lifetime value and a lot more. It gives you a real-time view of your business performance and your data. The best part is there is no need for spreadsheet expertise or programming languages required for using this tool. Launch: This is a free plan where you will get unlimited data sources, API access and invoice entry etc. Mogul: Buy this plan at $125 with Email support, and one-click integrations for Stripe, PayPal, Braintree, etc. Volume: This is a custom pricing plan where you will get a core subscription (SaaS) metrics like MRR, churn, etc. If you want paid services you can contact the sales team. The analytics tool has a metric calculator which shows all the revenue related metrics like MRR, ARR, ARPU, etc.in a graphical format. The noteworthy feature is it notifies you about the loss in the total number of customers and revenue generated. You are able to track the customer details and lifetime value. After that, you can maximize your profits by analyzing the factor what exactly your customer want. 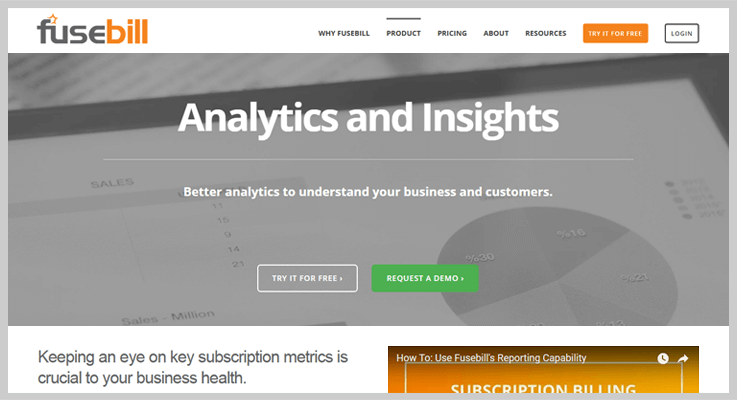 Fusebill analytics tool has provided you two different customer and subscription dashboards. Also, it gives you an easy MRR tracking, real-time revenue snapshots and a lot more. Using this payment processing tool you are able to see how your business performed yesterday, last week, last month or even last year. It helps you to analyze the recurring billing, revenue recognition, and catalog management. And, with this level of flexibility, you can rapidly make changes after analyzing to meet customer demands. 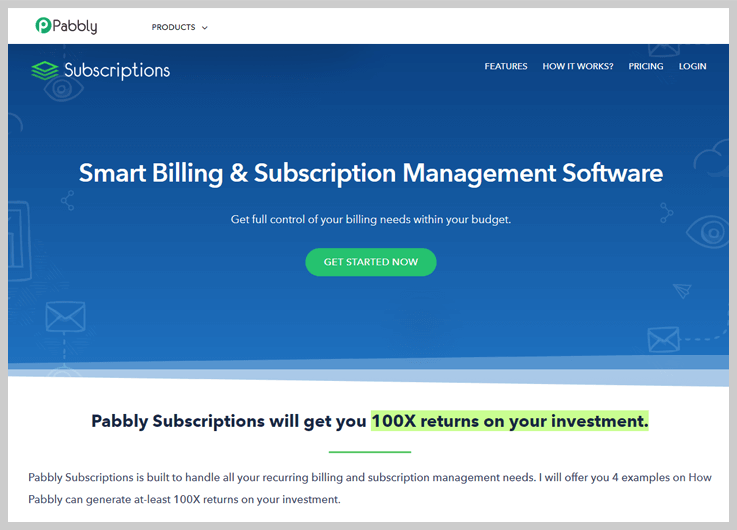 Start-Up: This plan cost you3w $99/Month which gives you basic onboarding, QuickBooks integration, and more. Rapid-Growth: Grab this amazing plan at $995/Month along with Salesforce integration, fixed monthly cost and a lot more. Enterprise: This plan has a custom pricing where first you will get a free trial. And, if you want a paid plan you can contact the sales team. It provides you with powerful segmentation reporting so that you are able to monitor all the metrics in a separate and more clear way. The tool has a financial calendar which you can easily drill down to see all activities that occurred on any given day. With the help of leveraging projected invoices, you can also predict future invoices and payments in the fraction of time. As you read all the PayPal analytics tools in the list. We hope you have found the best analytical tool in the list according to your requirement. All the analytics payment tools given above is best as per our knowledge. With the help of the above-mentioned data analytics tools you are able to track the total number of sales, & all the other important metrics which helps you to grow your business also it saves your time. Stay tuned for more useful analytics tools. For any suggestions or queries, drop a comment below & we’ll get back to you soon!